The problem with this tradition is that it’s based, at least somewhat, on emotion. On feelings. Which is why I told my daughter on Friday morning that we would not be cutting down our tree that day. Who could think about cutting a tree down under that blistering sun? Only a fool would cut down a winter tree on such a warm day. My daughter was distraught by the news, even as we spent some of that morning skiing the melting slush at Alpine Valley. Saturday was colder, but still warm. 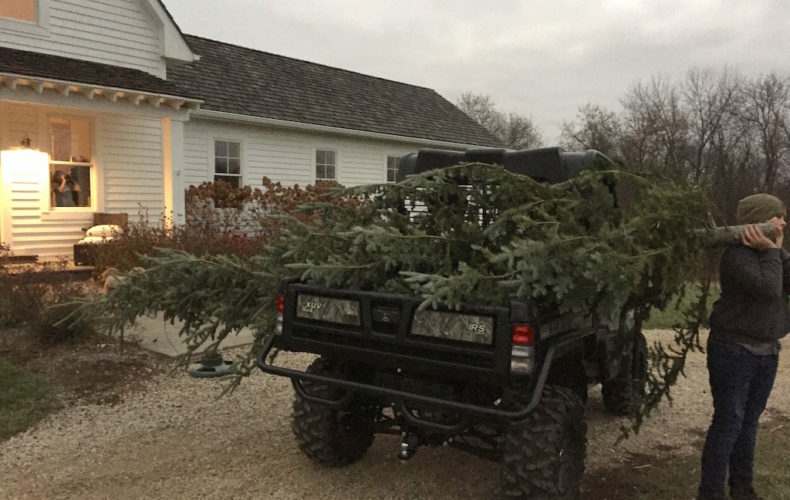 Sunday was chilly in the morning, and knowing I was running out of time to continue this tradition, we loaded up the Gator and drove down the road to pick, cut, and haul the tree that would become our 2017 Christmas Tree. Fast forward. I sawed the tree down, we hauled it back on the roof of our UTV, my daughter beamed. I trimmed the trunk, crammed it into the heavy iron base, and in spite of five watchful eyes, the final adjustments to plumb and level left us with a tilting fir. The tote of 2016 lights was pulled from the corner of the basement, and the light checking process began. First strand. Works! At least a few of them did. The first half didn’t, the second half did. The next strand, nothing. And the third and fourth, nothing. A few more half strands, a few more duds. When the lights were all checked there were three sections in the working pile and ten in the garbage pile. The lights that I bought last year, carefully unwound and stored in my lidded tote, were duds. Walmart could save us from the darkness, but when I stood in the light aisle, jostling for position and staring at the bounty of different lighting options, I felt uneasy. I know not to buy colored lights. I know not to buy flashing lights. The strobe effect is dizzying. There were LED and green wires and white wires, and larger bulbs and smaller bulbs. Bulbs shaped like teardrops and others shaped like gum balls. Some smooth and others rough like a cheese grater. I’ve erred before while buying lights, falling victim to the white wire strand when I clearly wanted the green wire. I surveyed the wall of lights. My daughter stood back, silent, knowing this was a decision for a father. For a man. My wife had mentioned some lights she liked in the RH catalog. But this was Walmart, and so I’d have to match the fancy style with whatever lights were available in Delavan on that day. I settled on some LED lights that promised 25,000 hours of lighting. The bulbs were shaped, the glass etched, they were fancy. Expensive, considering the other lights on those shelves. 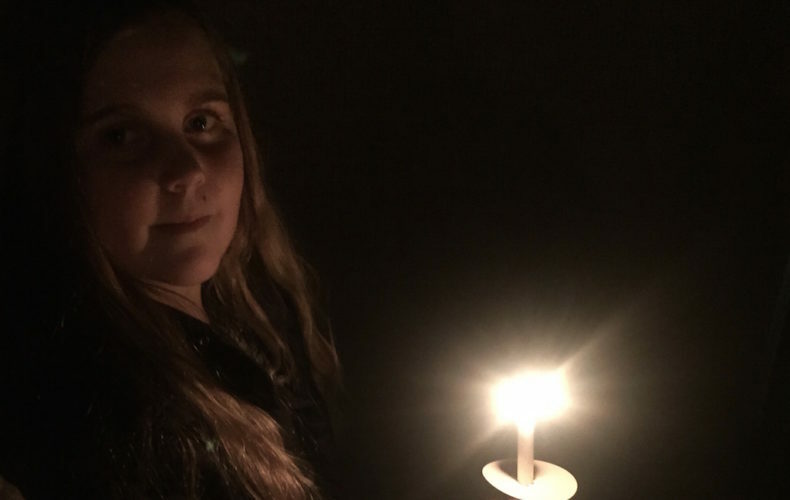 I felt like I was doing the right thing, right by my daughter, right by my wife, right by the planet, on account of the LED. I’m a big fan of the big reveal, which meant I wouldn’t turn on one section of lights before the entire tree was lit. The six boxes were enough, if a bit light, as I should have bought seven. Maybe eight. But the tree was lit and the ladder was needed to get close enough to the top of the 15′ Fir. Now all we needed was an extension cord. After scouring the Christmas Totes, we had none, but we did have those left over strands of lights from last year, so we used that twinkly section to connect the outlet to our new, beautiful LED lights. There was no hurrah, no particular fanfare. No Griswold moment of delayed satisfaction. But when I plugged in those lights something awful happened. The LED bulbs turned on. Their eery, cold light pushed through the pine needles, barely. The late afternoon sun was fading by then, but the now lit tree somehow made the room darker. The lights weren’t white, not really. They looked white on the box. They looked white when we put them up. But now electrified, they were blue. I checked the remnant boxes that were scattered on the floor. Cool White. I bought Cool White LEDs, which are cleverly named because no one in their right mind would buy blue Christmas lights. The greatest trick the devil ever played was not making people believe he doesn’t exist. No, his greatest trick was labeling blue lights Cool White. Tonight, there’s no need to ask me what I’ll be doing. I’ll be taking down Christmas lights and replacing them with ultra cheap, warm, glowing, green wired Christmas lights. And next year, I’ll throw those new lights into the garbage, because that’s our tradition. While watching a movie, I think it’s common to live vicariously through the lead character. This probably isn’t true for some movies, as there’s no dedicated star to wish to be. When I watch the Bourne movies I feel as though I should take some fighting classes. Not self defense classes, just fighting classes. I’m jealous of all the fighting skill. When I watch Top Gun I wish to be at those controls, in that cockpit, shooting down the enemy. But when I watch Ace Ventura I don’t wish to be Ace. I don’t want to have all of those animals in my room. I don’t want that hair. I can’t relate. I watched It’s A Wonderful Life again last weekend. Imagining being George Bailey isn’t really very difficult for me. George never left his home town, and neither did I. George went to work at a family business, and in a looser way, so did I. I feel, in the way that any small town kid might, that George Bailey is me and I am he. I have an old man Potter in my life. I feel his pain when he wonders what might have been. Had he been able to go off to see the world. Had he invested in the plastics business. Had he been a bit more shrewd in the lending business. The only difference between the two of us is that I never lost the hearing in my left ear, because neither of my brothers were dumb enough to slide on a shovel into open water. Besides these obvious similarities, the stronger connection in this movie is not between small town boys. It’s not the connection between angels and their wings. It’s the connection between business and stress. That’s really what this movie is about, after all. It’s about anxiety. George is faced with a problem. His sloppy uncle inadvertently sticks $8000 into Potter’s newspaper, and on the same day that the bank examiner happens to be in town for a visit. George panics. He begs Potter to bail him out. Potter only turns up the heat. Law enforcement is coming. George is going to jail. Except, is he? He doesn’t think he is, because he tells his Uncle that one of the two of them are going to jail and it isn’t going to be him. No, George isn’t going to jail. But he screams at his wife and kids and overturns the Golden Gate Bridge and slips out for a night of drunken despair. In the end, George’s wife goes out and begs the town for some help, and help they do. No man who has friends is poor. Or something like that. That’s the moral in the cinema. But the real takeaway is back to the anxiety. The stress. The feeling as though it is all on your singular shoulders. George should have sat down with the bank examiner and explained what happened. If the bank examiner didn’t buy the story, George should have gone out and called everyone he knew. He called Sam Wainwright, but Sam was busy or something. Later, when the townspeople are giving George their last $5, Wainwright sends a telegram. He’s directing his bank to wire $25,000 to George Bailey immediate. George was only upside down $8k. Why did he need $25k from Hee Haw? If he got the $25k that easily, and quickly, why did the maid have to give George the money she had earmarked to pay for her future divorce? Once the $25k wire was announced, I would have quietly pulled my ten dollar bill out of the pile. The whole story is a sham. Because the crisis in this movie isn’t ever really a crisis. In the way that a deal going south on a Thursday isn’t really a crisis. In business, and in real estate, we tend to forget what actually matters. Deals do not matter. If I live another 20 years and die, will the Johnson deal on First Street ever matter to me? Or will the way I treated my son when he left his light on this morning for the millionth time be the thing I regret? These deals consume me, and they make me into a person that I don’t particularly like. They needn’t do that. This year has been a stressful year for me. Successful, sure, but at a cost. When surrounded by customers who routinely fail to keep perspective it’s easy to fall prey to anxiety. After all, that’s all that really happened to George. He wasn’t going to jail. His crisis lasted all of a few hours. He woke up that day feeling fine and he went to bed that night feeling fine. It was the in between overreaction that nearly killed him. I’m going to take a few days off to celebrate Christmas. My wife is home with the flu, so I’ll mostly be tiptoeing around my house trying not to touch any doorknobs or faucet handles. But whether you’re on the heels of a Hanukkah celebrations or just about to begin your Christmas joy, I wish you a most peaceful Holiday season. A man in a sweater. He’s sitting on the couch. The sweater isn’t very nice, implying it’s not his dinner-sweater. It’s his Christmas morning sweater. He fumbles with batteries. The plastic container is too difficult to open with bare hands, too inconvenient to open after walking to the kitchen for a knife. Or a scissors. A child plays in the background. The room is bright. It’s Christmas morning. In Arizona, maybe. It can’t be here, because there’s a child in the room and there’s no way he’d have waited for the light to grow to brighten the room before opening his presents. Kids open presents in the dim dark of dawn. But here we are, in the light, in this room, with the batteries and the sweater and a kid in the distance. The Christmas tree is there, too. There is no wife. Not yet, anyway. But wait, here she comes. Rushing into the scene, full of joy and beauty and optimism. She jumps on her husband, pushing him down on the couch in one excited tackle. She’s beaming. She says nothing, but everything, her eyes dancing. The husband, his batteries cast aside, says, “so you like it“. It’s not a question, he knows the answer. She looks at him longingly and says yes. But we, like our sweatered battery-fumbling friend, already know she likes it. She jumped on him to say it. What is this gift? What made this wife so filled with wonder and amazement at the finely honed gift giving skills of her otherwise normal husband? Why, it’s an intertwined necklace made of the fine diamond shavings that are swept up after the real diamond jewelry is made. This one is in the shape of a swan, with a duck in the middle, a swan and a duck. Both with bills, caressing each other, necking with their necks ablaze in tiny shards of diamond dust. The message is simple. Ducks and geese can be friends, and if them, why not us? Ducks and Geese, forever at last. Be the duck, be the goose, Forever, the commercial says. The woman ponders her husband’s face with suggestive intent, wondering how he could be so perfect. He, yes he, that man, thought enough of this woman to buy that $169 collection of diamond dust, and she has never, ever been happier. Cut to scene. A bow. Huge, red. Draped over the car. It’s in the garage. No, it’s outside. The snow has fallen. Fresh snow, but the car is perfect. Shiny and bright like a showroom model. It’s outside their house. They live in the mountains. The house is made of stone and hewn lumber. Spruce trees dappled with snow, everywhere. 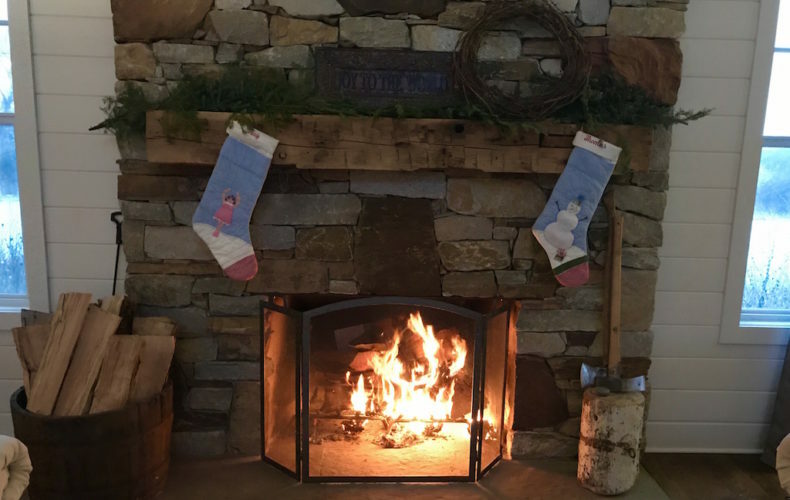 The man, inside, near the fireplace, shaking his present. With one pull of the bouncing red ribbon the box is opened. It’s a key. He knows that that means. He opens the door, his children near him, his wife excited. There it is. That car. It’s white, like the snow, and the bow is red, like the ribbon. The husband is so happy. I’ve never seen him happier. Never mind that he would have never bought himself a white car on purpose, he’s still thrilled. The wife knows he’s thrilled. He deserves this car. He’s suffered for too long in that mountain house of hand cut granite and scraped cedar. He’s lived, cooped up in that low-key existence for too long. This is his chance. At age 42, it’s the first good thing that has ever happened to him. No-one deserves this car, and the eight-hundred and thirty-seven dollar monthly payment more. This week, I have presents to buy. Thankfully, television has taught me everything I need to know in order to be a most effective, loved, admired, wanted gift-giver. I’ve erred in my gift giving previously, but no longer. I want in on the starstruck wife on Christmas morning thing. If you happen to see my wife this week, don’t mention any of this to her. I’m off to Kay Jewelers, or Zales, or whichever one is in the closest mall, and I cannot wait to see the look on her face when she sees that I not only opted for the Duck/Goose/Intertwined Neck/Heart Pendant, but I added the gift wrapping AND the 12 month warranty. This is going to be the best Christmas ever. I should have started a cooking blog. My first post would have been about chocolate chip cookies. That’s SEO gold. I’d sprinkle in mentions of famous chefs’ names, and then, by now, after so many years I’d have a tremendous following. I would write a cook book. People would buy it. I’d be a guest on some cooking shows. Probably Ellen would also have me on. Things would be better then. I’d have a publicist and an agent. Then I’d have my television show. My blog would be somewhat dormant by that time, but then every once in a while I’d write something. DAVE’S BEST CHOCOLATE CHIP COOKIES. The likes and shares would be uncountable. But instead I write about real estate, and no one really cares. Some people care, but they cared more when they felt the market needed a steadier hand. Now it’s just a frenzy, and careful contemplation is out of style. That’s why I’m going to write about wreaths today. My wife has been bugging me to write about these wreaths for a month. I told her I would. I wasn’t sure if I actually would. It didn’t feel appropriate to write about wintery things in the heart of fall. It would be like writing about fall in July. No one wants to hear that nonsense. 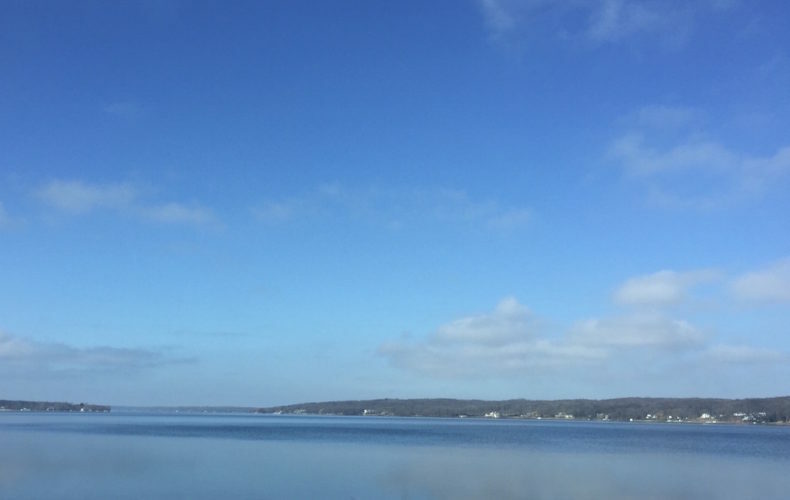 This morning it’s cold, it’s dark, and anyone who isn’t aware of the pressing nature of the winter season simply hasn’t been paying any sort of attention. Today, wreaths. My kids are selling the wreaths. They aren’t selling them because they particularly want to sell them. 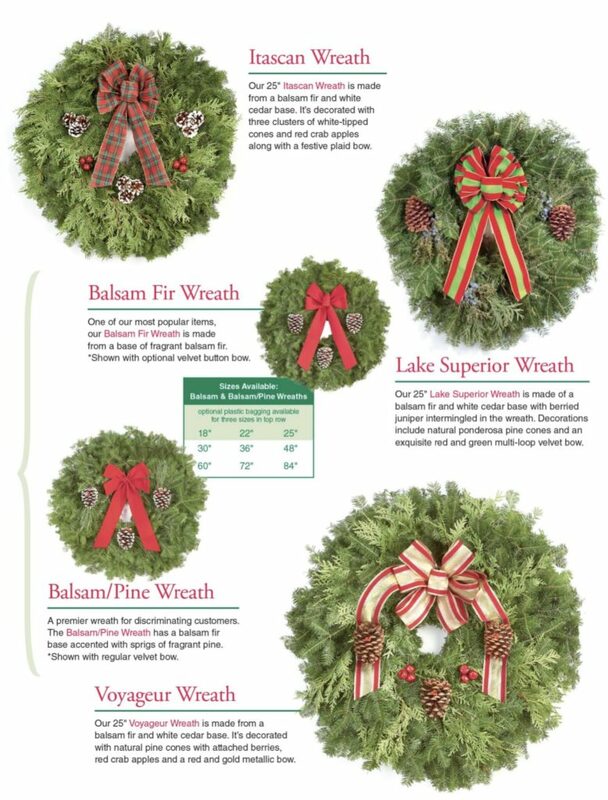 They’re selling these wreaths because they go to a small private school, and as is the nature with small private schools in rural areas, there’s nothing easy about making payroll. There’s nothing easy about keeping the lights on. There’s nothing easy about any of it, and so fundraisers are not so much a means to buy neato wiz bang technologies for the school, they’re a way to keep the doors open. I don’t often appeal to this group for fundraising efforts, but since it’s a Monday and my wife is mad at me, here’s the information. Besides, I don’t even have a terrific chocolate chip cookie recipe. 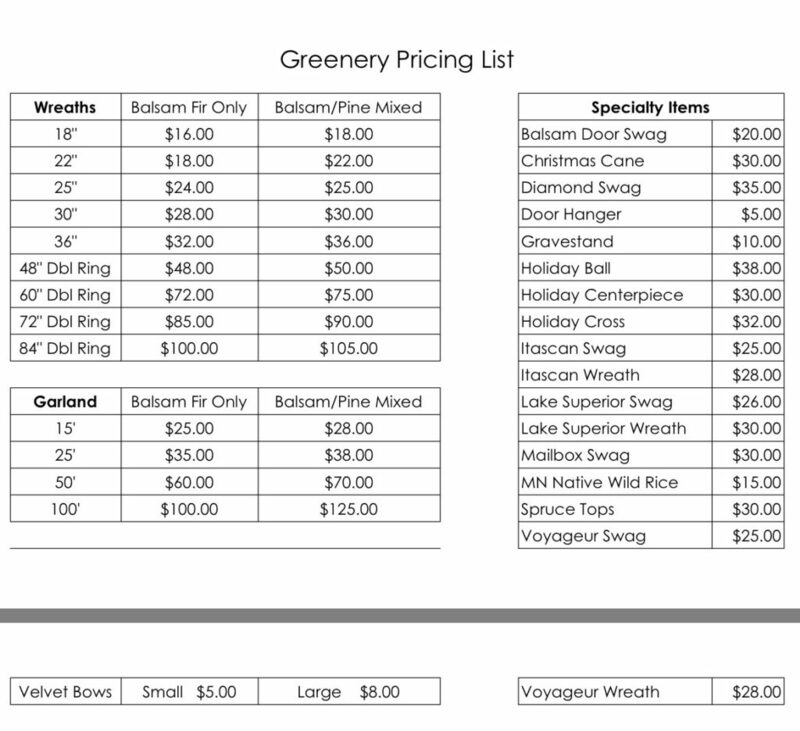 If you’d like a wreath, or a bunch of wreaths, or some garland or maybe some other bits of greenery, here are your options. You could just shoot me an email and tell me what you’d like and I’ll put in the order. I believe the wreaths arrive something around Thanksgiving, so I’ll be heading out at that time with my kids and we’ll deliver your order. Maybe my wife is right. 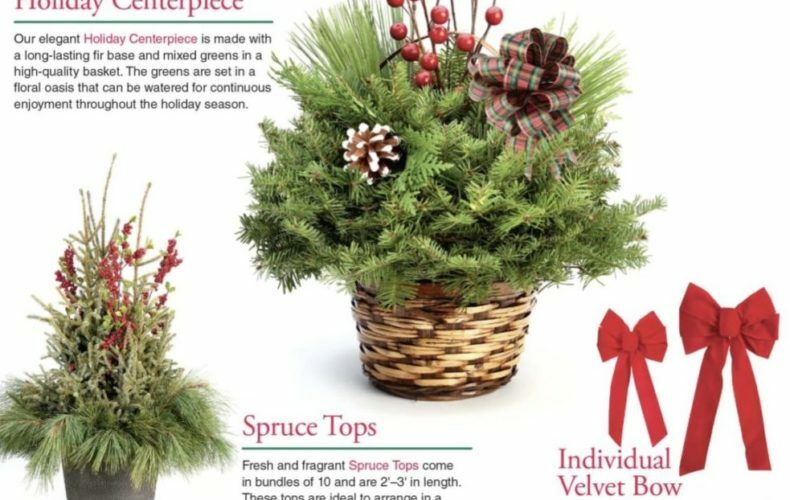 Maybe you’re going to buy some wreaths anyway so you might as well buy them from someone who will bring them right to your doorstep?